Bridget “Biddy” Mason (August 15, 1818 – January 15, 1891) was an African-American nurse and a Californian real estate entrepreneur and philanthropist. 1856 – Smith transports slaves to California, a free state, where Judge Hayes declares Biddy Mason’s family entitled to freedom and free forever. 1866 – From 10 years’ wages Biddy saves $250 to buy this homestead lots 3 and 8, Block 7 of the Ord Survey, a bit out of town, amid gardens and groves. Biddy Mason started a church in her home, she owned the land & building which was later used by Pastor Seymour for the historic Azusa meetings. 1880-1890 – Biddy nurses the sick, comforts prisoners, and pays a grocery at 4th and Spring streets to feed all the families made homeless by seasonal flooding. 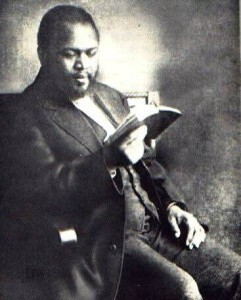 In 1905, William J. Seymour, the one-eyed 34-year-old son of former slaves, was a student of well-known Pentecostal preacher Charles Parham and an interim pastor for a small holiness church in Houston, Texas. Neely Terry, an African American woman who attended a small holiness church pastor-ed by Julia Hutchins in Los Angeles, made a trip to visit family in Houston late in 1905. While in Houston, she visited Seymour’s church, where he preached receiving the Holy Ghost with the evidence of speaking in others tongues, and though he had not experienced this personally, Terry was impressed with his character and message. Once home in California, Terry suggested that Seymour be invited to speak at the local church.Seymour received and accepted the invitation in February 1906, and he received financial help and a blessing from Parham for his planned one-month visit. 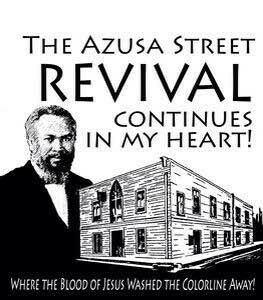 Seymour arrived in Los Angeles on February 22, 1906, and within two days was preaching at Julia Hutchins’ church at the corner of Ninth Street and Santa Fe Avenue. During his first sermon, he preached that speaking in tongues was the first biblical evidence of the inevitable infilling in the Holy Ghost. On the following Sunday, March 4, he returned to the church and found that Hutchins had padlocked the door. Elders of the church rejected Seymour’s teaching, primarily because he had not yet experienced the blessing about which he was preaching. Seymour and his small group of new followers soon relocated to the home of Richard and Ruth Asberry at 216 North Bonnie Brae Street. White families from local holiness churches began to attend as well. The group would get together regularly and pray to receive the baptism of the Holy Spirit. On April 9, 1906, after five weeks of Seymour’s preaching andprayer, and three days into an intended 10-day fast, Edward S. Lee spoke in tongues for the first time. At the next meeting, Seymour shared Lee’s testimony and preached a sermon on Acts 2:4 and soon six others began to speak in tongues as well, including Jennie Moore, who would later become Seymour’s wife.